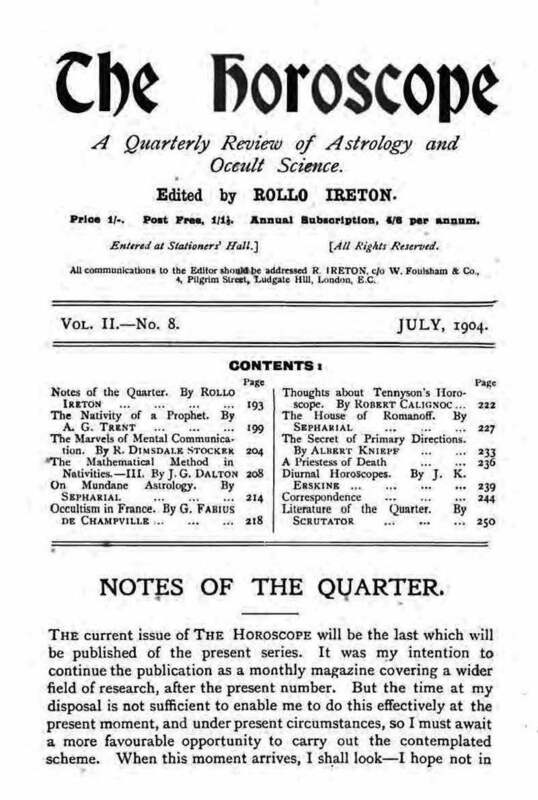 A Quarterly Review of Astrology and Occult Science. London, England. Publisher: W. Foulsham & Co.
1/1, October 1902-July 1904. 64 pp., 6 1/2 x 10. 4/6 a year. The journal stated its purpose as to be a "review of reviews," but the it was an unfocused mixture of occultism and astrology. Ireton (Ralph Shirley, 1865-1946) obviously learned his lesson from the journal because in 1905 he began the long-lived Occult Review. Considerable astrological content, with articles by Walter Old ("Sephariel"), Heinrich Däath, Maud Annesley, George Wild, and Walter K. Lewis, S.L. Macgregor Mathers (on Iamblichus), G. Fabius de Champville, et al. NYPL; BL; Northwestern University.